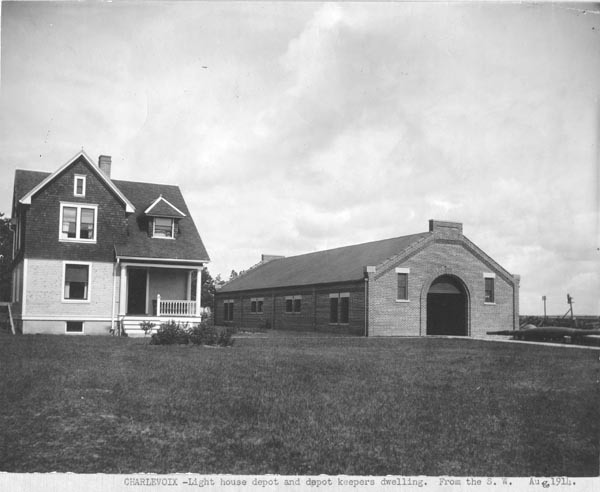 Charlevoix Lighthouse Depot August 1914. Depot Keepers house to the left and the storage depot facility to the right. 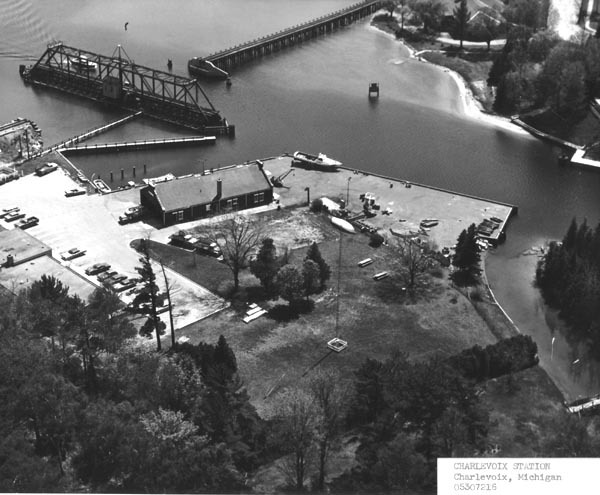 The Charlevoix lighthouse depot is located on Lake Charlevoix on the north west side of a narrow channel that goes into a smaller portion of the lake before it flows into Lake Michigan. It is located in the protected back waters off Lake Michigan so lighthouse tenders could come in to dock out front with no trouble from rough open water. Depot's held supplies used by the lighthouse service such as lamps, lenses, buoy's, sinkers, chains and other such supplies and performed repairs to these items as well. 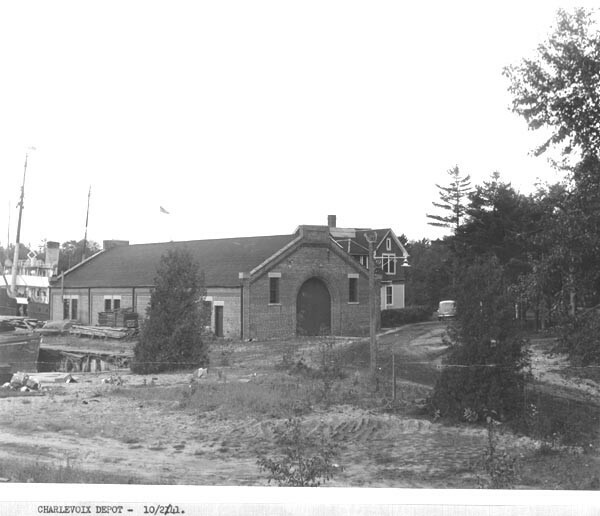 Depot's were located in strategic points around the lakes to make the most efficient use of supplies and service the lighthouses in the region. 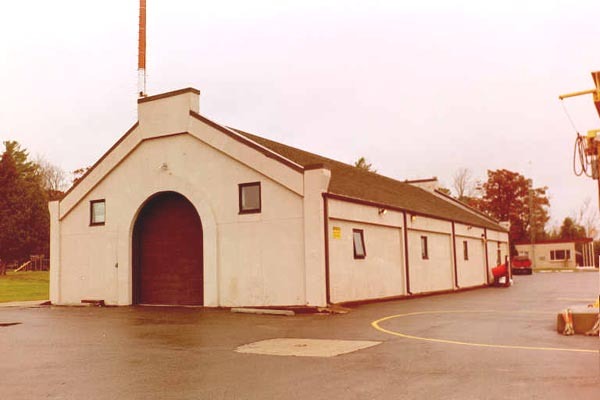 As the Lighthouse Service was merged into the Coast Guard most depots were closed down for less centralized facilities spread out further from each other in the lakes. Some depots like this one are still in use as a storage/garage facility with the Coast Guard and has been saved from the wrecking ball. This is a small depot compared to ones like in Detroit and Saint Joseph Michigan. As ships became larger and faster smaller buoy depots were no longer needed. Luckily for this one the 180 foot Buoy Tender Acacia docked in Charlevoix still uses this depot for winter storage and repairs. This depot has been modified over time and now appears with stucco on the outside of the brick building but remains for the most part intact. A rail system is installed in the floor of the building where lighthouse tenders would unload supplies and they would bring them into the building with it. The pier out front has been extended further out into the channel and so it became useless and is now almost completely cemented in. The photo above is in the later years of the lighthouse depot. The area that is disturbed just below the depot in the yard is what remained after the keepers dwelling was torn down and the new US Coast Guard Station built. Notice the train swing bridge at the top of the photo. It is no longer there and was torn down some time ago as well. Photo of the current facility with the stucco placed over the old brick structure.